National Ventilation’s Monsoon Energysaver™ IntelliSense fan has been shortlisted in the Electrical Industry Awards. The ventilation manufacturer’s ultra quiet, slim, modern, intelligent bathroom fan has been named as a finalist in the ‘Residential/Domestic Product of the Year’ category at these leading industry awards. The 26th Electrical Industry Awards takes place on Thursday 25th October at the Royal Garden Hotel, Kensington, London. One of the industry’s longest running and most prestigious award schemes, the Electrical Industry Awards is a celebration of the best electrical industry professionals have to offer and is a key date in the calendar with over 450 guests set to attend the evening. Extremely energy efficient, IntelliSense combines sophisticated smart controls, smooth operation and high performance. Designed to help achieve good indoor air quality (IAQ) IntelliSense features an intelligent, fully automatic, ambient response humidity sensor for moisture control that learns and adjusts itself to the right level according to the environment. By continually monitoring and recording the moisture content, IntelliSense maps the humidity profile throughout the year. This means the fan learns to run only when it can make a difference to IAQ and lowers the moisture content in the air, effectively tackling condensation and mould. The fan also offers two modes for moisture control, silent or acceleration mode, which can be selected via the touch pad control to suit household needs. IntelliSense is designed to ensure end-users can easily control and understand the fan’s functions without needing to read the manual, thanks to the visual indicator that shows which mode is currently active. Another useful feature available with the IntelliSense is the automatic airing function. If the fan has been inactive for 25 hours, it runs an airing programme for 60 minutes to exchange the air in the bathroom. This function means you can avoid stuffy, musty odours in the bathroom when you have been away for a while. Featuring flexible installation options, IntelliSense can be installed as either an intermittent or a continuous fan, making it ideal for a wide range of rooms and properties. This means electricians need to carry a smaller selection of products in their vans. Offering simple set-up the IntelliSense features an easy-to-use integrated control panel. This allows exact adjustment with options for extract modes, timer functions and speed control plus the ability to choose different capacities for different functions. The IntelliSense’s timer function can activate via the light switch, pull cord or a separate switch. The fan offers further control flexibility since it features a timer with a selectable start delay function and three extended end-of-run times, in addition to the automatic airing function, plus the option for constant operation at an adjustable speed. When the fan is first connected to the power supply, it performs a self-test where all the status lamps on the control panel are tested, as well as the function of the motor. This is ideal for electricians since it allows them to check that everything works. Supplied with a choice of two removable spigots, the fan can also be surface mounted onto a wall without any spigot. This is ideal function if you have a duct with a smaller dimension than 100mm or a duct that bends directly off the back of the fan not providing any depth in the wall for the spigot. IntelliSense is also suitable for installation on an uneven surface, giving further installation flexibility. And at only 31mm deep, it’s as unobtrusive as possible plus, the fan comes with an optional wall plate which avoids the need for redecoration and gives a professional finish. 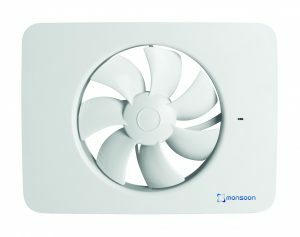 Suitable for bathrooms, toilets and utility areas the highly efficient IntelliSense is built to last, it has a low-voltage motor fitted with double ball bearings for a long service life and energy consumption as low as 5 watts on maximum, about a third of what a conventional bathroom fan uses. Offering high performance of up to 134m3/hr makes this a very effective fan that is also very quiet at only 12 DBA meaning no more irritating drone when the fan is switched on.